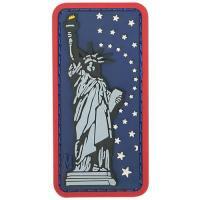 Show off personal style while keeping spirits high with the Lady Liberty Morale Patch from Maxpedition. The patch proudly displays the epic statue that greets newcomers in New York's harbor with a red, white and blue themed background and frame. Maxpedition's patches are made from PVC rubber for exceptionally bold coloring, lasting durability and effortless maintenance--simply wipe clean with ordinary soap and water. Lady Liberty features a hook-backing and interfaces with any looped panel, including those commonly found on Maxpedition bags. If apparel or gear doesn't have a loop panel, the patch comes with an extra one for convenient stitching and more permanent attachment.